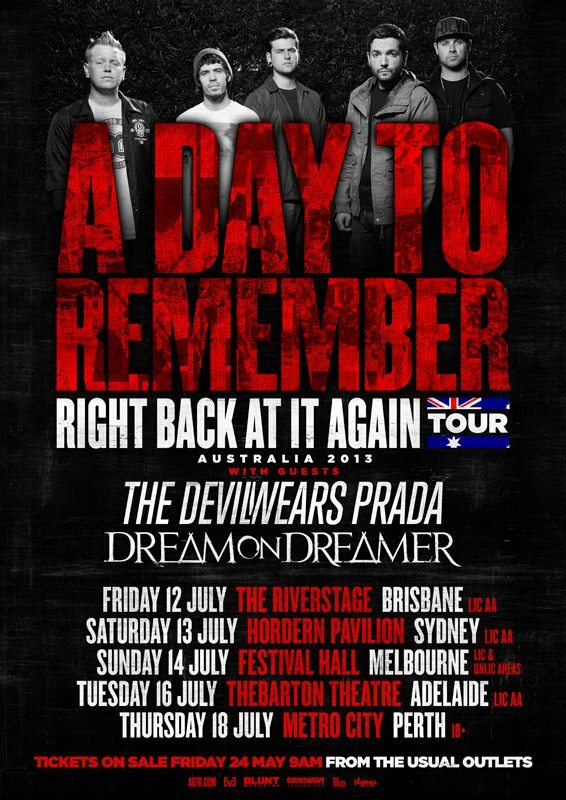 It's just been announced that A Day To Remember will be returning to Australia, along with The Devil Wears Prada and Dream On Dreamer. After crushing audiences with their main stage performances at Soundwave 2012, July brings the welcome return of Florida's pop-mosh lords, A Day To Remember, armed with their brand new album Common Courtesy. With 5 albums under their belt, each one further cementing the band's reign as true leaders of the genre, ADTR effortlessly blend brutal breakdowns and melodic choruses. The new single Violence (Enough is Enough) showcases A Day To Remember at their pop infused metal core finest. Forget everything you knew about The Devil Wears Prada. The metalcore maverics' latest album Dead Throne signals a more evolved, more progressive The Devil Wears Prada that is not only larger sonically, but goes much deeper, lyrically. Dream On Dreamer have built a worldwide fanbase to the envy of most Australian bands. After the massive worldwide success of their debut album Heartbound in 2011, Dream On Dreamer will release their much anticipated sophomore record Loveless on Friday 28th June.